Most shoulder problems are characterised by pain and a reduced range of movement at the shoulder joint. 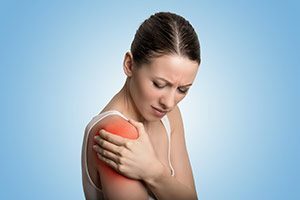 This pain gives you an unpleasant reminder of just how much you use your shoulder and arm in a day. It often causes an uncomfortable night in bed and it will make it difficult to play sports too. Shoulder pain is often not easy to treat and this is due to the complexity of the joint. It usually takes longer to treat this joint than any other area of the body as there are dozens of muscles that need to be coordinated to control the joint. The key to treating the joint is for the osteopath to find a way through the many layers of problems that are contributing to the dysfunction. Osteopathic treatment will usually resolve shoulder pain and restore the range of movement lost.